Rosy Starling, Sturnus roseus in Delhi, India on 12 Apr 2009. Rosy Starling, Sturnus roseus at KGNP, Bharatpur, India on 16 Aug 2006. 528. Pastor roseus. 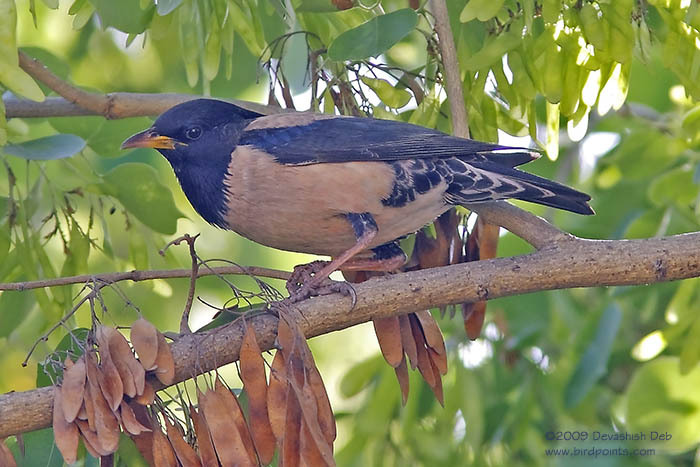 The Rose-coloured Starling. Turdus roseus, Linn. Syst. Nat. i, p. 294 (1766). Pastor roseus (Linn, Blyth, Cat. p. 111; Horsf. & M. Cat. ii, p. 539; Jerd. B. I. ii, p. 333; Beavan, Ibis, 1867, p. 331; Hume, S. F. i, p. 208; Ball, S. F. iii, p. 208; Scully, S. F. iv, p. 164; Hume, Cat. no. 690; Doig, S. F. viii, p. 374; Legge, Birds Ceyl p. 673; Barnes, Birds Bom. p. 257; Sharpe, Cat. B. M. xiii, p. 63; Oates in Hume’s N. & E. 2nd ed. i, p. 368. Coloration. The adult in summer has the whole head, crest, neck, chin, throat and upper breast, wings and tail glossy black; under wing-coverts and axillaries black, edged with white; thighs, a patch on each flank, and the under tail-coverts black tipped with white; remainder of the plumage rose-colour. After the autumn moult and throughout the winter the black feathers of the head, throat, and neck are tipped with buff. These tips are cast at the end of winter, or get worn off. The sexes are very similar, but the female is perhaps slightly paler, with a shorter crest. The nestling has the whole plumage sandy brown, the feathers of the crown with darker centres, the lower plumage paler and more inclined to white; the whole fore neck streaked with brown; wings and tail dark brown, each feather edged with pale buff. At the first autumn moult the rose-colour is assumed in a faint form, some black feathers make their appearance on the upper breast, and the wings and tail become black. The fully adult plumage is probably not assumed till the second autumn, and is acquired by a gradual change of colour, not of feather. Iris dark brown; legs and feet yellowish brown; bill pinkish, flesh, brown on the culmen (Butler). Length about 9; tail 2.5; wing 5.2; tarsus 1.25; bill from gape 1.3. Distribution. The whole of India as far east as Western Bengal, Ball recording this species from Manbhoom. It is found on the lower ranges of the Himalayas as far east as Sikhim. It extends to Ceylon, and is said to have occurred in the Andamans. It is absent from India from about the middle of May to the beginning of July, but is abundant at other times. It occurs over a considerable portion of Europe and Western and Central Asia. Habits, &c. Occurs in large flocks, feeding chiefly on or near the ground on grain, fruit, and insects. 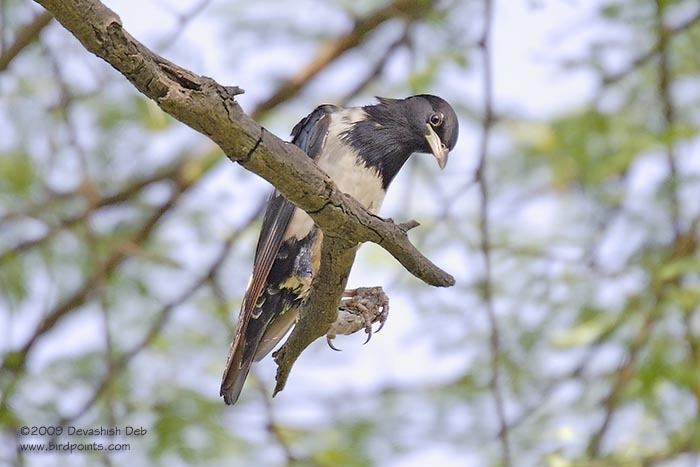 This Starling has not been found breeding in any part of India. It breeds in large societies in Asia Minor and other parts in June, on rocky hill-sides, constructing its nest, which is merely a small pad of grass, on the ground, under stones, or even in the open. The eggs, varying from two to five, are white or bluish white, and measure about 1.1 by 0.8.